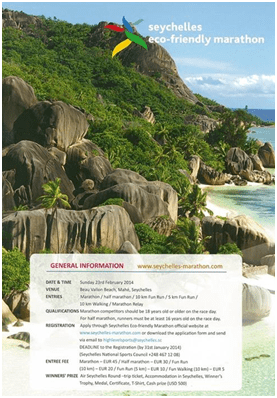 With very nominal entry fees for the various races, a full and a half marathon, a 10 and 5 kilometre ‘fun run’ and a 10 kilometre ‘fun walk’ this is the Seychelles’ most widely known land based sporting event, alongside the Seychelles Regatta which sails across the azure waters of the archipelago. A full calendar of major festivals and events, cultural, music, food, international friendship weeks and sports can be accessed through the tourism board’s main website www.seychelles.travel which also offers an insight into the great variety of accommodation facilities available, information on terrestrial and marine national parks and reserves and a broad insight into life on the archipelago. The Seychelles is connected to the wider world by Air Seychelles and their partners Etihad, via Abu Dhabi to Hong Kong and soon Paris again, and offer direct flights to Mauritius and Johannesburg. Emirates, with 12 flights a week, brings the world to Mahe with one stop in Dubai and Kenya Airways now flies 4 times a week to the Seychelles, connecting Africa to the archipelago. Seychelles, truly Another World.